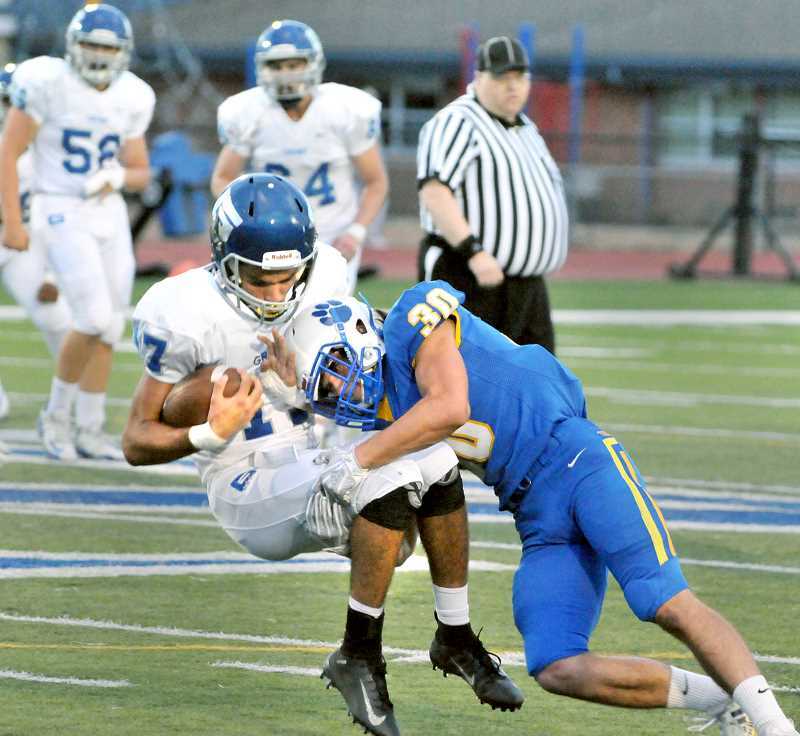 Newberg defended well enough to win its season opener, allowing just seven points, but South Salem took advantage of big plays on special teams to hand the Tigers a 21-14 defeat on Aug. 31. The Tiger defense was even better in their first home game of the season Friday night versus Grant, but Newberg also played a cleaner game offensively and pounced on a pair of special teams mistakes in the second half shut to rout the Generals 28-0 Friday night at Loran Douglas Field. "In the second half, the defense took over the game," NHS coach Kevin Hastin said. "We didn't do much on offense. We didn't have the ball very much, but our defense controlled the second half and created points for us. In two games we've given up seven points, so I'm excited about that." The Tigers got off to a nearly perfect start, marching the ball 72 yards in eight plays to take the lead, though the extra point was wide following running back Justin Holtan's 15-yard touchdown run, so it was 6-0 3:54 into the contest. "I think that first drive set the tone for the game," Hastin said. "We marched it, got some first downs and punched it in." The teams proceded to trade punts and turnovers over the next seven possessions, with Grant driving deep into Newberg territory late in the second quarter only to stall out due to an ineligible man downfield penalty. The Tigers then finished the opening half just like they started it, mounting an 11-play, 64-yard drive that was capped by a seven-yard touchdown scramble by senior quarterback Gage Wright with 9.9 seconds left before the break. Holtan ran in the two-point conversion to make it 14-0. Grant got off to a good start in the third quarter, starting its drive in Newberg territory and moving the ball to the 14-yard line in just three plays. The Tiger defense managed to force a field goal attempt, which Enrique Miller proceeded to block to turn the momentum around. The Generals did force a three and out on Newberg's ensuing drive, but lightning delayed the game with the Tigers set to punt on fourth down. 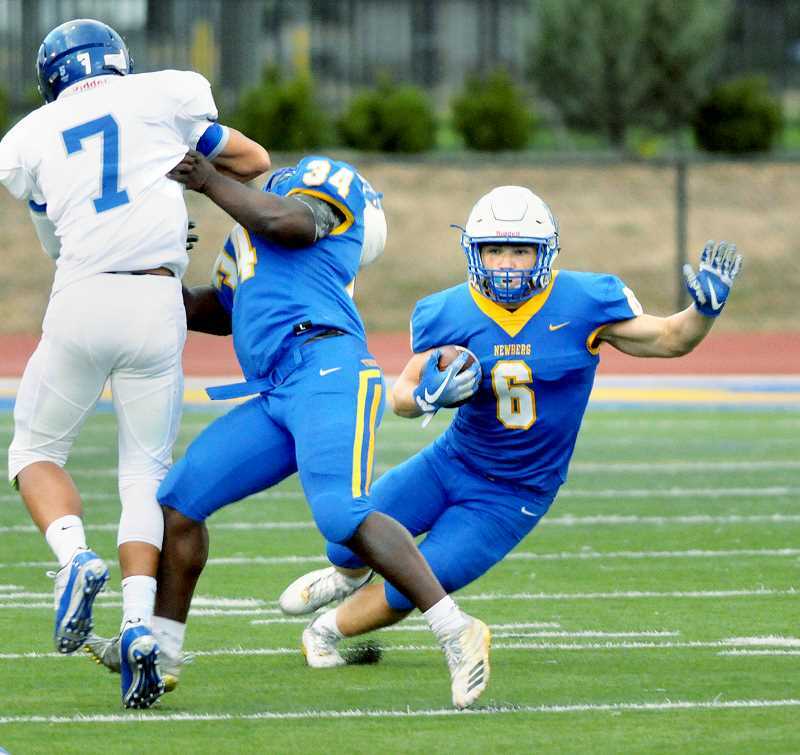 After returning to the field about 40 minutes later, the tide turned in Newberg's favor for good as Grant's returner had the ball punched out around the 40-yard line. It went directly into the arms of defensive back Truman Connelly, who promptly returned it for a touchdown and a 21-0 lead with 8:35 left in the third. "There was no one in front of me," Connelly said. "I was shocked. I saw the hit and I saw the ball pop out. I thought it was going to bounce, but it went right into my hands." Newberg then forced a three and out and was gifted another score after Grant snapped the ball over its punter, who was then tackled at the 1-yard line. Senior fullback Lawrence Lundgren scored on the next play to make it 28-0. The Generals managed to drive deep into enemy territory once more, but quarterback Sam Simril was intercepted by Holtan with 8:49 remaining. The Tigers proceeded to kill the rest of the clock with a 14-play drive that covered 61 yards. "It's nice to see our hard work reflected on the scoreboard," Hastin said. "We know that we've made strides and sometimes it didn't reflect on the scoreboard, so it's great to see it for the kids. The goal is just to get better every week and we definitely feel we got better from last week. We have to come back and have a great week of practice because Summit is going to be a tough opponent." Grant coach John Beck credited Newberg (1-1) for winning at the point of attack and controlling the pace of the game, but at the same time felt his team didn't take advantage of the opportunities it had offensively. "We had a chance down 14-0," he said. "We stopped 'em, take the ball and drove the ball right down. We didn't have a problem driving it down there, but then we stall out and don't get any points on the board with a blocked field goal. If we would have capitalized, in a shootout, I'd take us. But you have to give coach Hastin and those little scrappy dudes credit." The Generals (1-1) will look to rebound next week at home versus West Salem. Newberg will attempt to take it's momentum on the road for it's matchup at Summit. This article brought to you courtesy of Kay Newell, Sunlan Lighting, Inc. Portland Tribune Insider Lighting Expert. This article brought to you courtesy of Debbie Petrie, The Wig Gallery, Portland Tribune Insider Expert. Fiduciary: Why is this so important? What do all those terms mean? This article brought to you courtesy of Kay Newell, Of Sunlan Lighting, Inc., Portland Tribune Lighting Expert.